What is hemp? The hemp plant, otherwise known as Cannabis Sativa, is a flowering plant or herb that has been cultivated for centuries for a multitude of purposes. It is an extremely robust and versatile plant that has many ecological benefits. The cultivation of hemp has a positive impact on the environment, and it is one of the most environmentally sustainable crops that can be grown. It reinvigorates the soil and has a supportive influence on the biodiversity of the environment wherever it is planted. The hemp plant is also naturally resistant to pests, and therefore does not require the use of pesticides, herbicides, or fungicides. Its large upper leaves naturally push out weeds and it grows very quickly, maturing in three to four months as well as using less water than crops such as cotton. Hemp is also highly useful and can be grown for the purpose of manufacturing a wide variety of industrial and consumer products. In fact, it is probably one of the most useful plants known to humanity, as nearly every part of the hemp plant can be utilized in some way. Hemp fiber, which comes from the stalks of the plant, is known as bast. It is extremely durable and is known for its comfort, strength, resistance to mold and ultraviolet light, as well as its absorbent qualities. Hemp produces 250% more fiber than cotton. It is also stronger than cotton and can be used to make clothing, shoes, paper, canvas, carpeting, rope, bags, luggage, home furnishings, construction materials, biodegradable plastics, and even auto parts. It can be used to create building materials that are twice as strong as wood or concrete. The use of hemp in the production of paper products, along with other fibers such as kenaf, could help save forests and trees from deforestation. Hemp is 77% cellulose and unlike wood pulp, it does not require toxic chemicals such as dioxins and chloroforms to make paper. In fact, it can produce four times as much paper per acre as trees without the environmental hazards and in a more sustainable manner. Hemp oil, which is extracted from the seeds of the hemp plant, also has a variety of uses. It can be used in cosmetics and body care products, nutritional supplements, and food products, as well as for industrial purposes. The oil is high in essential fatty acids or EFA’s, particularly in omega-6 and omega-3 EFA’s, as well as Gamma Linolenic acid(GLA). It can be used in cooking, added to salads, and used in dressings and condiments. The seeds themselves can also be eaten. In addition to their EFA content, they are also rich in protein, containing 20% protein content, as well as minerals. The seeds may be eaten raw, added to soups and salads, used in baking, used as cereal, flour, sprouted, turned into tofu or nut butters, used as a protein powder, added to smoothies or shakes, or made into tea. The fresh leaves of the hemp plant are also edible. Oil from hemp can also be used to create an eco-friendly alternative to petroleum based paints, oils, and inks. In addition, there is the potential for the oil to be used as a base in household cleaners. Yet one of the most promising and compelling uses of the hemp plant is its potential as an alternative source of energy in the form of clean-burning bio-fuels like biodiesel and ethanol fuel. In fact, energy from hemp based fuel is higher than any other crop produced for the purpose of creating bio-fuel. Hemp is like a gift to humankind. It seems like there is no limit to what can be done with this versatile plant. With all these advantages, one would think that hemp products would be more widely available and utilized. However, there is much controversy surrounding this plant. The controversy stems (pardon the pun!) from its botanical composition and its relation to marijuana. 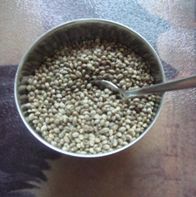 Industrial hemp is characterized by its low levels of the chemical THC (tetrahydrocannibinol) in its leaves and flowers Hemp was widely cultivated in the US from colonial times up until the mid 1800’s. 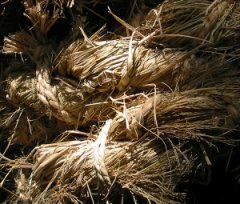 It was commonly used in the production of fabrics, as well as twine, hemp paper and rope, which were all commonly used during this time period. The use of hemp was phased out when cotton became more widely grown to make fabrics but also because of US government fears of cannabis being used as a recreational drug. Between 1914 and 1933, 33 states passed laws to restrict the legal production of hemp. This was a result of the government attempting to control the use of Cannabis leaves for their recreational drug use. The US govt. first restricted the use of hemp in the late 1930’s under the Marijuana Tax Act (50 stat 551). This was due to the psychoactive properties of some varieties of the Cannabis plant. Becasue of this, hemp cannot be grown in the United States, and all hemp or hemp products must be imported or manufactured from imported hemp. Although it is still illegal to grow hemp in the US, it is widely cultivated in the rest of the world, including Canada, Europe, the UK, and China, the latter of which grows more hemp than any other country in the world. 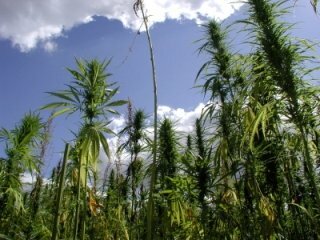 There is a growing movement in the US to legalize the production of hemp crops in the United States. Return from Hemp Plant to Green-Organic-World.com's Home Page.